Trout are one of the cold-water fatty fishes loaded with the omega-3 fatty acids that are so good for our hearts and brains. Paleolithic man ate much more omega-3 and much less omega-6 fatty acids than modern man. 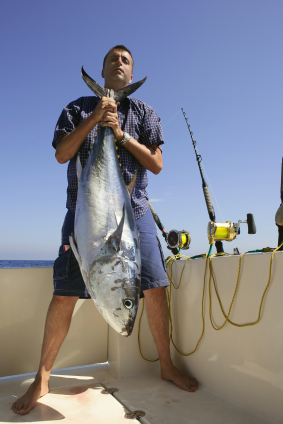 Eating cold-water fatty fish is a great way to get back to that ancestral balance. This recipe serves two. First, make a marinade. In a glass or plastic bowl, mix 5 tbsp (75 ml) of the olive oil, 3 of the diced garlic cloves (9 g), parsley, salt, pepper, lemon juice, and basil. 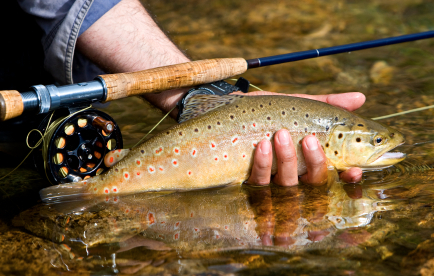 Place the trout in a medium sized (8 or 9-inch or 20–23 cm diameter) glass baking dish, then cover with the marinade. Let sit in the refrigerator for 1–2 hours, turning occasionally. Preheat oven to 375°F (190°C). Pull the fish dish out of the refrigerator once you start the preheat process. Cover the glass dish with aluminum foil, then bake in oven for 20–40 minutes. This is a judgment all. When done, it should flake apart readily with a fork. This cooking method works well for trout salmon, cod, tilapia, and perhaps others. Consider squeezing fresh lemon juice on the cooked fish for extra zing. Start on the vegetables about ten minutes after the fish go in the oven. Put the broccoli, cauliflower, and carrots in a microwave-safe dish, add about four fl oz (120 ml) of water, and microwave (covered) on high for four minutes. If you don’t have a cover, just use a water-moistened paper towel. While they cook, heat 2 tbsp (30 ml) of the olive oil in a medium-sized pan over medium heat (with one clove of diced garlic) for a couple minutes to release the garlic flavor. Drain the water off the microwaved vegetables, then sauté them in the olive oil pan for a couple minutes, stirring frequently. 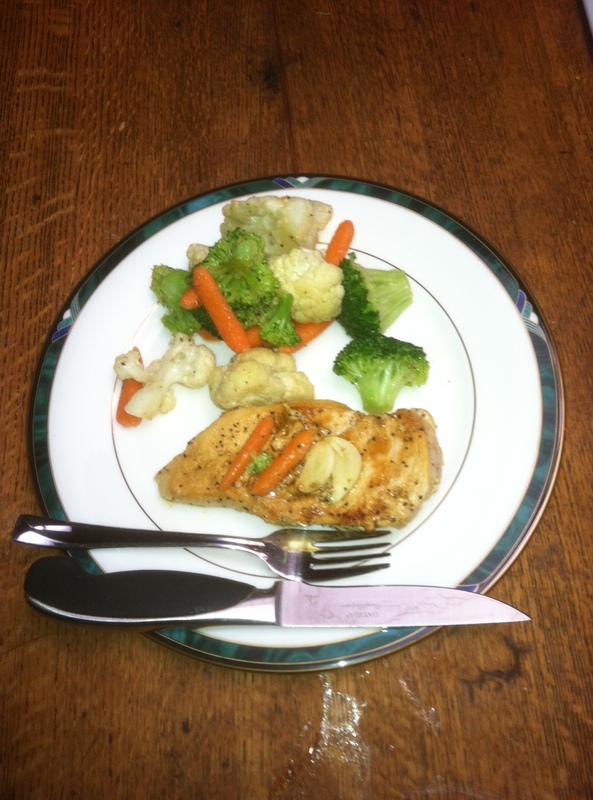 Add your commercial vegetable seasoning when you start sautéing or at any point thereafter, even at the table. Enjoy the apple for desert. If you’re making chili, you might as well make a batch you can dip into over several days. It only gets better with time (up to a point!). Cut the Italian sausage into small pieces. Sauté the sausage, ground beef, onion, and garlic in a large pot. Don’t just brown the meat; cook it thoroughly. When done, drain off the fat if desired (but why waste those good calories?). Add the remainder of ingredients, bring to a boil, then simmer for about an hour. Add additional water if the chili looks too thick. This meal is a staple at our house. The chicken we use is frozen breast because it’s less expensive but tastes just as good as fresh. Use never-frozen chicken or another part of the chicken if you prefer. Remember the sitcom “Everybody Loves Raymond”? Lemon chicken was Debra’s signature meal. Now you can make it! The ingredients here are for two servings. 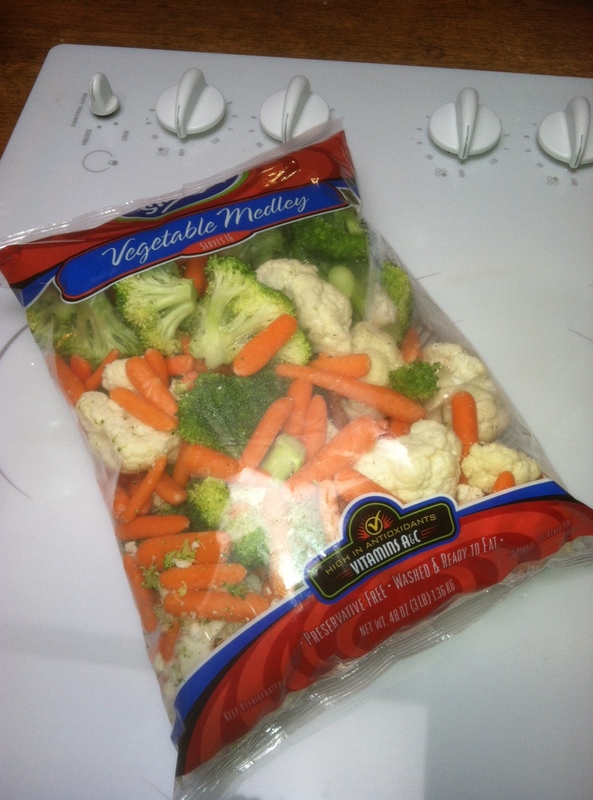 We buy a large bag of vegetables called “vegetable medley” that has equal parts broccoli, cauliflower, and carrots. Start on the chicken first. 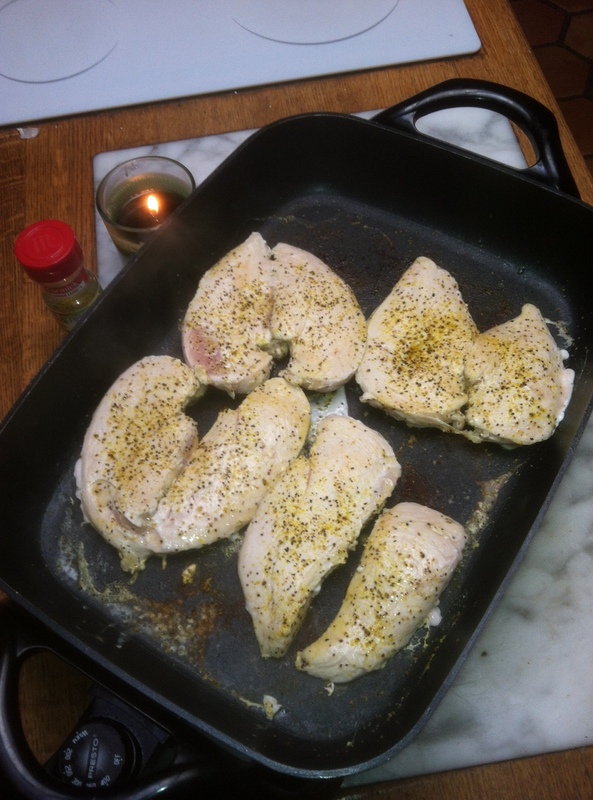 Sauté the breasts in a pan over medium heat. You don’t need to thaw it beforehand. While cooking, sprinkle with the lemon pepper seasoning. If the breasts are thick, you may want to “butterfly” them with a knife when half done, to speed up the cooking process. If you over-cook, the meat will be tougher. It should be done in roughly 10–15 minutes. While the chicken is cooking, get to work on your other items. Cook the vegetables thusly. Put the broccoli, cauliflower, and carrots in a microwave-safe dish, add about four fl oz (120 ml) of water, and microwave (covered) on high for four minutes. If you don’t have a cover, just use a water-soaked paper towel. While they cook, heat 2 tbsp (30 ml) of the olive oil in a medium-sized pan over medium heat, with the garlic, for a couple minutes to release the garlic flavor. Drain the water off the microwaved vegetables, then sauté them in the olive oil pan for a couple minutes, stirring frequently. 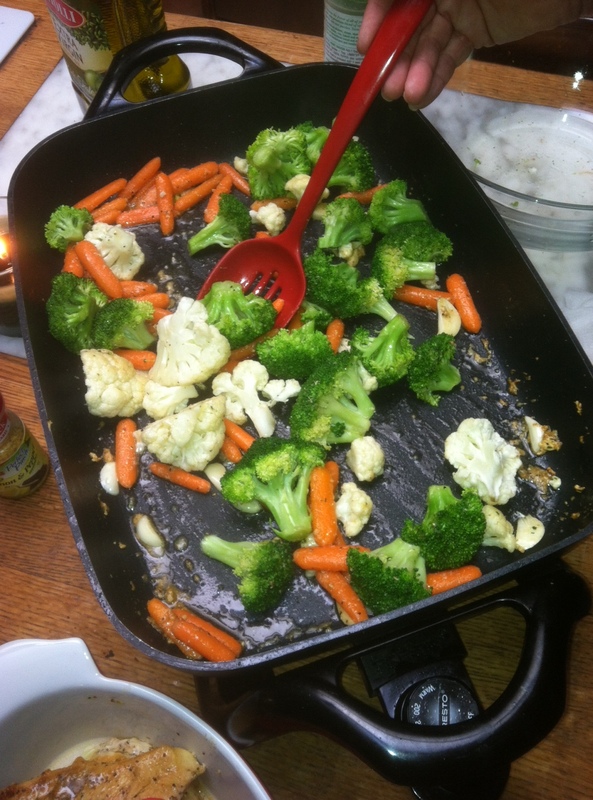 Add your commercial vegetable seasoning when you start sautéing or at any point thereafter, even at the table. Finally the salad. In a large bowl, place the lettuce, tomatoes, sunflower seeds, cucumber, celery, bacon bits, 3 tbsp (45 ml) olive oil, and vinegar. Mix thoroughly. For a bit of zing, you might enjoy a few squirts of fresh lemon juice on the vegetables or salad just before eating. I’m putting together some paleo diabetic meals for you. Today’s offering works for lunch or dinner (where I come from, dinner is the evening meal). 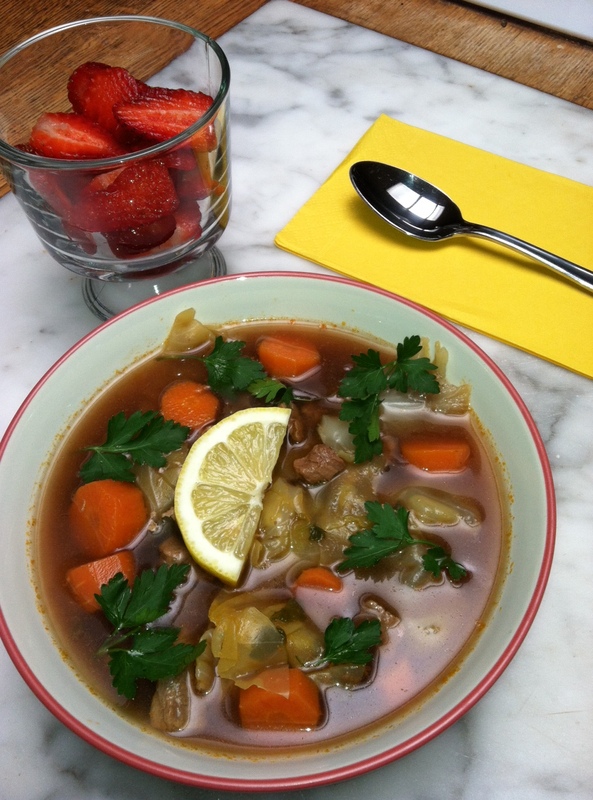 See my recipe for Hearty Cabbage Soup. Salad: In a bowl, place the lettuce, spinach, tomato chunks, sliced cucumber, adn finally, the olive oil and vinegar. Mix thoroughly. Salt and pepper to taste. If you’re avoiding salt, consider substituting a few squirts of fresh lemon juice. This is an easy lunch or dinner. For a different flavor and twice the calcium, you could substitute canned sardines for the tuna, but I’ve never tried it. In a 3-quart (3 liter) bowl, put lettuce, onion, tomatoes, and tuna (3.25 oz or 90 g at this point). Add olive oil, balsamic vinegar, and salt and pepper to taste Mix well with a fork. Enjoy almonds separately, before, during, or after salad. For extra zing, add a few squirts of fresh lemon juice. This is a neat trick if you’re trying to avoid salt.